Mira is a place that has a lot of potential. It’s central. It’s swanky. It’s backed by a trio of solid professionals: Hanif Harji of ICONINK (Byblos, Weslodge, Patria, Figo, La Société), Maher Murshed (Navigate Group) and Stuart Cameron (ICONINK). So, when I heard this team was opening a restaurant dedicated to artfully-presented Peruvian plates, I was curious to see if it would be as impressive as the view from Machu Picchu. Mira’s name was inspired by the Miraflores neighbourhood in Lima. Making its home in the former F-Stop bar, down a pedestrian-only alley off of King Street West, it evoked nostalgia from the days of bottle service and nights way past my bedtime. Fresh flowers and plants were draped around the outdoor patio and small lights and candles provided romantic lighting in the club-like entrance. 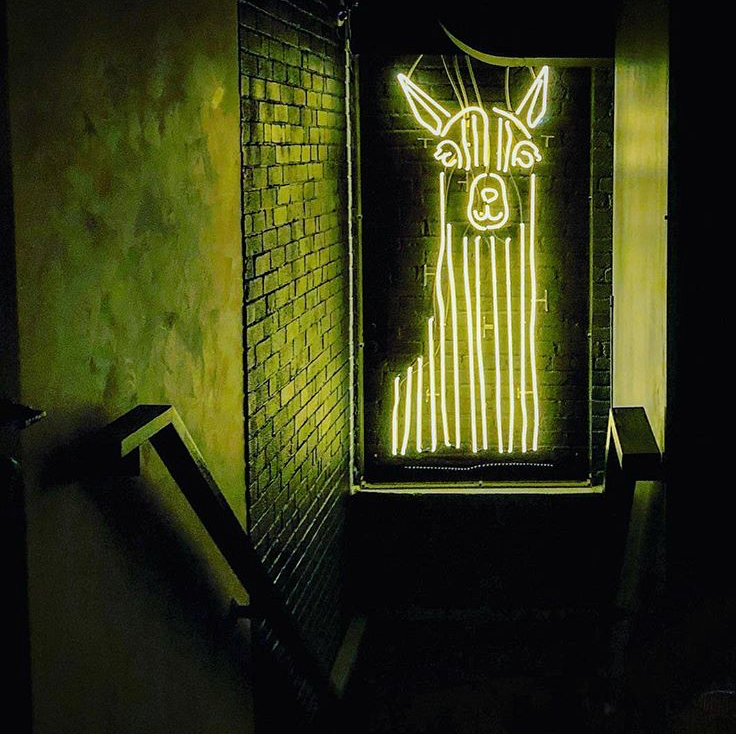 One look inside, and its colourful interior screamed South America—from the quirky murals and deep hues, to the neon Alpaca sign. 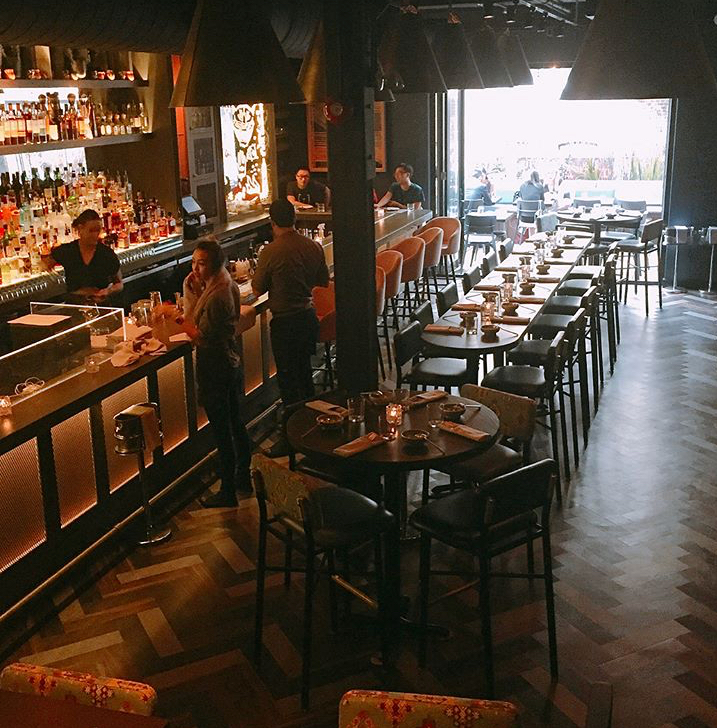 Like many of ICONINK’s other restaurants, it was evident that time and money were poured into the décor and ambiance, making it a great spot for a hot rendez-vous. The open kitchen and stylish bar were the highlights of the interior. My guest and I were greeted warmly and led to the front patio, which was de rigueur for our late Saturday dinner. One thing I noticed as soon as we were seated was the uneven heights of the banquette versus my guest’s seat. There was also some kerfuffle about which server was assigned to our section. A flustered waitress appeared and flung some menus and a wine list on the table. Like most of ICONINK’s establishments, they are strong in the libations category. The expansive drink menu featured cocktails, wines and beers. Thirst quenchers included the Victoria, a creative cocktail with pisco (South American brandy), lime, pineapple, spiced pineapple-infused honey, aji amarillo pepper and red peppercorn. We were quickly floored by the outrageously-priced bottles and glasses of wine ($30 for nine ounces of Rodney Strong Chardonnay (2015) from Sonoma, California, but were impressed when we saw the generous pour that looked more like half a bottle than the average wine glass serving. Apparently, Cameron and his culinary team spent years sourcing native Peruvian ingredients, such as indigenous potatoes, herbs and spices. 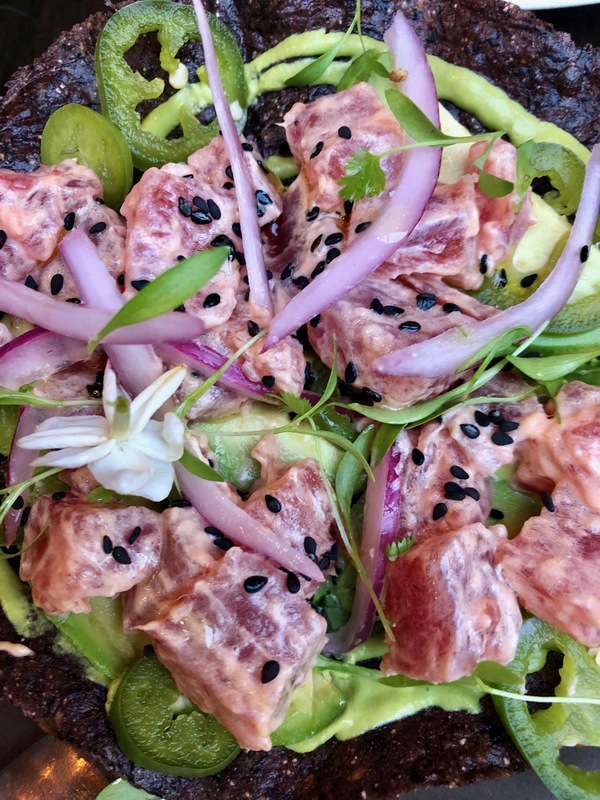 I perused the menu, and saw several South American influences — from ceviches galore to tiger’s milk or leche de tigre, a rich, acidic sauce that serves as the base and marinade for ceviches and tiraditos (Peruvian sashimi). There was also a strong Japanese influence, likely due to the number of Japanese immigrants living in Peru. I saw ingredients such as yuzu kosho, maitake mushrooms and annatto that reflected this influence. 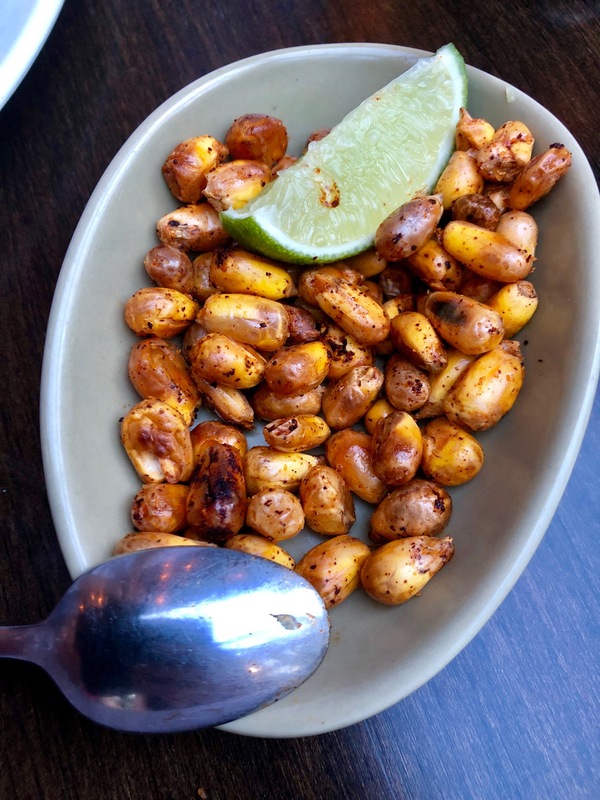 An amuse-bouche of cancha, a popular snack in Peru and Ecuador (think: Corn Nuts), landed on our table, just as standard bread and butter would be at most other spots. It was made with a special type of large-kernelled corn called maíz cancha chulpeand provided a salty, crunchy and extremely satisfying “pop” when I bit into it. This regional snack is also the perfect pairing for ceviche. Cancha, a popular snack in Peru and Ecuador. The menu was divided into four sections: appetizers, raw, meat/seafood and sides, with a strong emphasis on ceviche. Serving staff didn’t seem comfortable explaining terms likelúcumaand uchucuta—they were mumbled and rushed through. Mira serves five varieties of ceviche and tiraditosmost of which, in the traditional style, balanced the tangy sauce with sweet potato. The Mira Ceviche ($19) featured a firm translucently-sliced fish called corvina in a pool of tart marinade. Others featured tuna and grouper as the proteins. The Tostada Morado ($18) featured spicy tuna, cilantro crema and avocado on a thin layer of crispy purple corn. While the tostada, in name and in flavour combination, was more like something you’d find at a Mexican/Japanese fusion restaurant, it was délicieux and slightly acidic, providing a good alternative to traditional ceviche. I also liked how it was cut table-side with two large spoons — showing off the perfectly crisp texture of the tostada. The Ensalada de Remolacha ($14) arrived next, and was an artfully-prepared salad consisting of whole baby beets, hearts of palm, honey, lime, pepitas, a goat cheese-uchucuta dressing and pistachio. 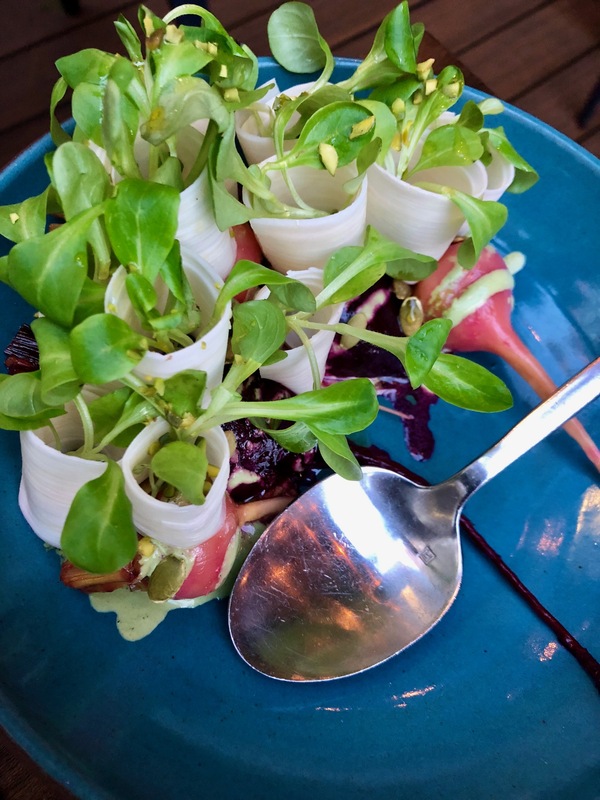 Ribbons of white hearts of palm sat on top of a bed of beets and all the flavours mingled nicely dans ma bouche. Both of our starters were pricey, and I was expecting more than just the stylish plating. There was a blip in service too, which wasn’t surprising given the way our evening started off. About five minutes after our appetizers arrived (we were still eating), our mains landed on the table. Shocked, I asked the server to take them back to la cuisine. She looked at me as if I was from another planet. The service continued to suffer with our appetizer plates sitting around for so long before being cleared that they practically grew mold. Our entrees arrived after waiting almost an hour (encore heureux we had that gigantic glass of wine). The Sudado de Pescado ($26) was a delightful dish featuring striped bass. 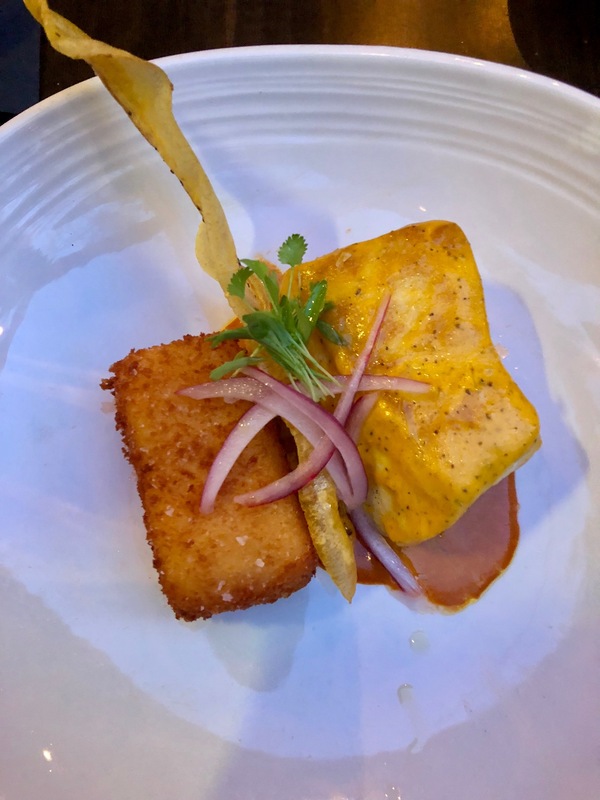 The accompanying chupe sauce, criollo and Amarillo causa (Peruvian potatoes covered with a spicy sauce) gave the mild-tasting bass a vibrant flavor. Although the plate was quite monochromatic, the deep-fried plantain provided a delicious textural component. 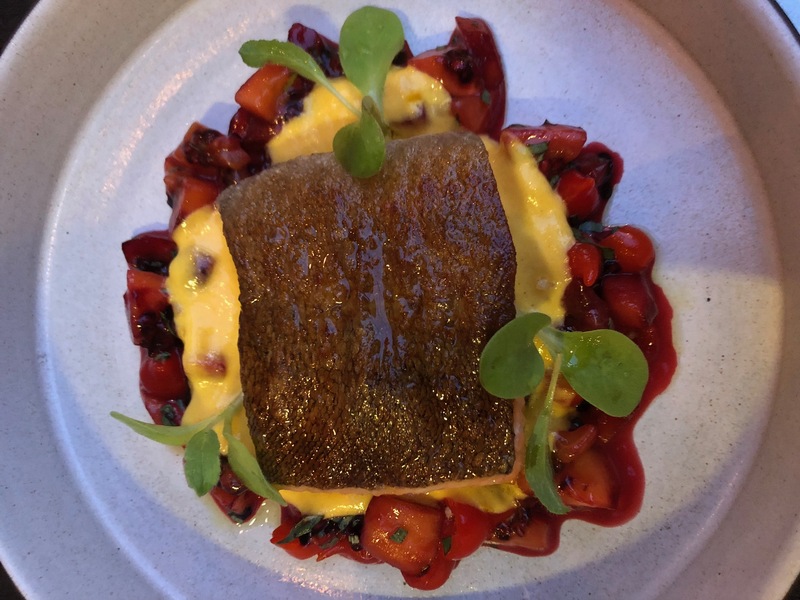 The presentation of the Trucha ($23), a skin-on trout from Kolapore Springs, was much more creative and colourful than the striped bass. A brightly-coloured tamarillo salsa and Incan red drop pepper encircled the filet, providing a sweet but tart flavor with manageable heat. 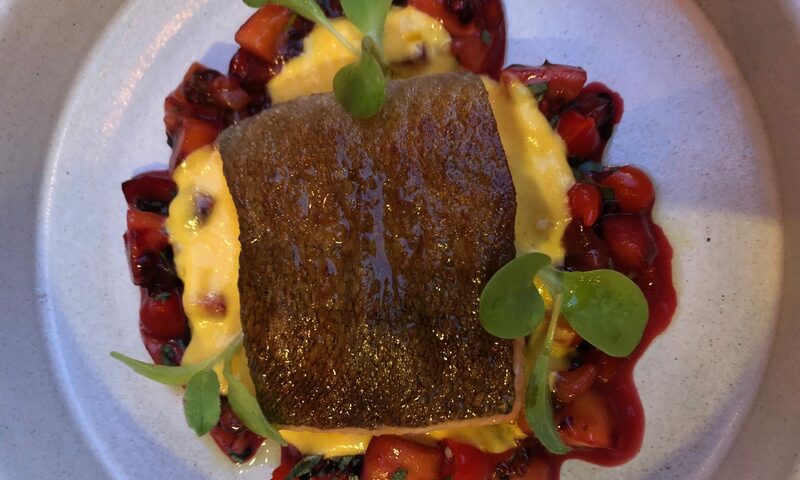 For this dish, I would have paired the ornamental peppers with a more delicate-flavoured fish, such as red snapper. When we were presented with the dessert menu, many options excited my taste buds. The majority of the five desserts were more Peruvian than the main menu, with options such as Mousse de Lúcuma ($11), made from a Peruvian fruit with a faint maple flavor. A fried mound of ring-shaped fritters called picarones ($9) were the most popular dessert, served with a lime-honey syrup. And, finalement, the El Huevo Malo ($14). It was the showstopper, and was a more affordable alternative to La Banane’s decadent chocolate egg. Mira’s variety was just as Instagram-worthy. When it was smashed, a deadly combination of coffee ice cream, chocolate ranfañote, honey comb, yuzu marmalade and raspberry oozed out. 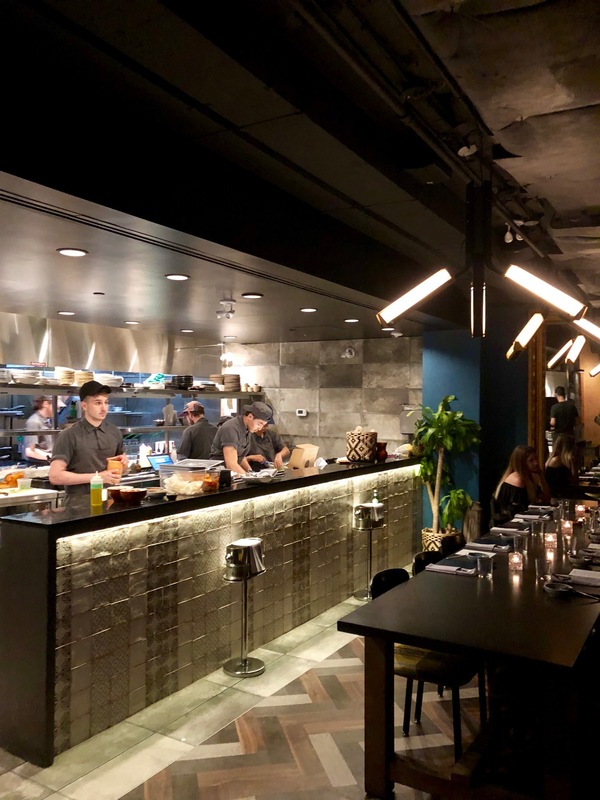 At Mira, Peruvian cuisine didn’t ultimately dominate the fare – but the country’s influences certainly did. I would have liked to see some more authentic specialties, like rachi, grilled tripe and olluquito – a hearty dish with shredded beef and small, slippery Andean potatoes. If you’re willing to pay for an expensive meal, you’ll likely enjoy your time at this boujie spot.